When an individual decides to gauge their piercings, eventually they need to change out the jewelry. Whether you used a non-traditional object to gauge your ears, or you had your ears gauged a long time ago, you may need to measure the jewelry, in order to determine the gauge you are currently at. 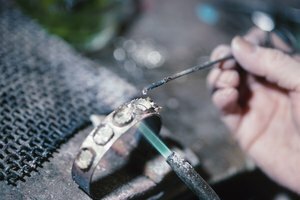 After you determine the gauge size, purchasing jewelry can be done quickly and without worries. Load the Monster Steel website in your web browser. This website has an interactive application which allows you to determine your gauge size quickly. Place a United States Quarter onto the screen, directly on top of the quarter displayed on the note book. Click the bigger and smaller options to adjust the quarter on the screen until it is the exact same size as the quarter you have in your hand. Click on the "Gauge" tab directly below the picture of the quarter. This will load a gauge table, allowing you to compare the jewelry on screen with your jewelry in order to determine the gauge. Remove your jewelry and line it up the the different sizes of gauge demonstrated on the screen. 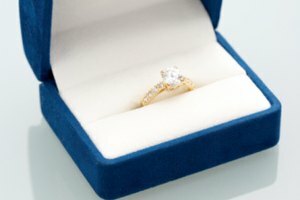 Move the end of your jewelry around to compare it with the other sizes. Once you find the measurement that your jewelry covers perfectly, read the size listed next to it.